Severe Tropical Cyclone Winston struck Fiji over the weekend as a monster cyclone with maximum sustained winds of 185 mph at landfall. 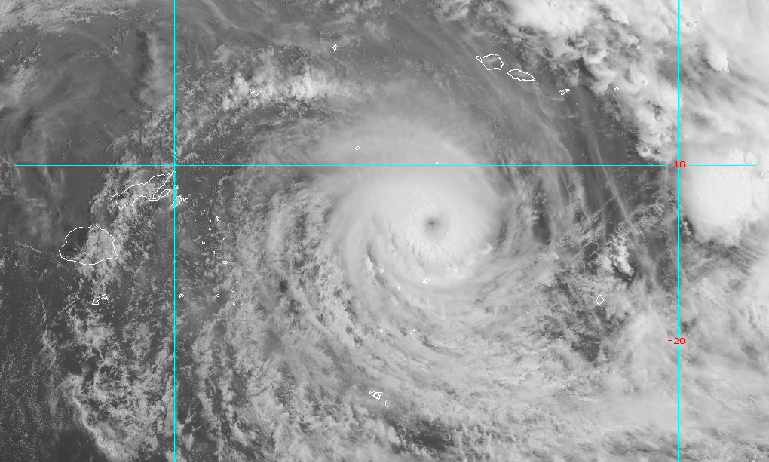 This makes Winston the strongest recorded cyclone in the Southern Hemisphere, and tied for the third highest wind speed at landfall, according to Jeff Masters’ Wunderblog post from Saturday. Severe Tropical Cyclone Winston as it approached landfall on Viti Levu on Sat Feb 20, 2016. According to ABC News in Australia, the cyclone has now killed at least 21 people. 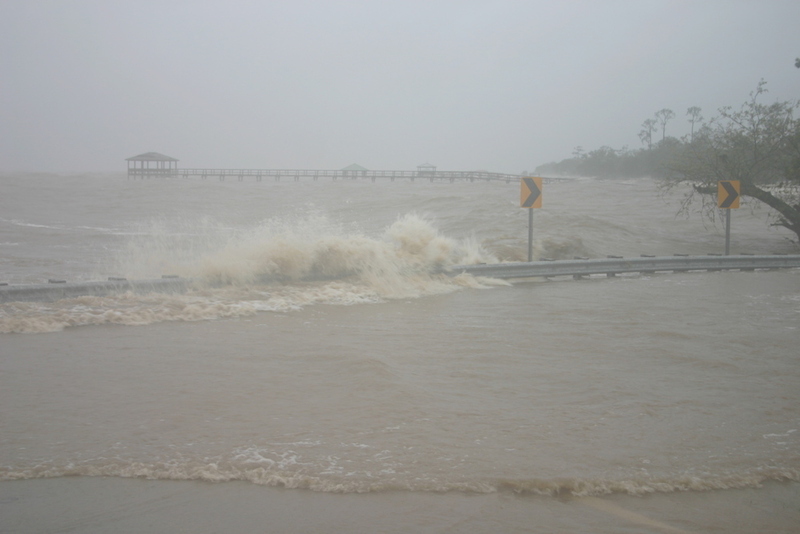 Air photos provide initial evidence of a storm surge of approximately 10 feet (3 m) in some coastal areas. More specifically, these high water marks are actually a combination of storm tide and waves, as tree bark removal is the primary means for such observations in the first days following a severe cyclone. Sharp contrasts in tree trunk color indicates the height of extreme water levels at this location in coastal Fiji. Post-storm photographs often show a sharp color distinction on many trees at around the same level. The power of water rapidly racing past the tree will rub off tree bark, and leave behind evidence of maximum water levels. In the photographs below, I've drawn arrows pointing at these lines. The color on these trees is grey below the line and brown above it. I think the arrow farthest on the right in the first photograph most clearly demonstrates this contrast. We can use other trees and the features on the buildings, like doors and windows, to get a rough idea of the scale. It appears that the height of tree bark removal is around 10 feet (3 m) in these photos, although future field work could more accurately make these measurements. The use of tree bark removal as a proxy for extreme water levels has been established as a credible field work technique, and has emerged as a useful practice in areas without operational tide gauges. 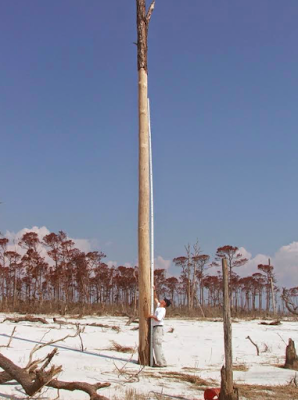 A 25.1-ft (7.65-m) rod does not quite reach the height of tree bark removal on East Ship Island, Mississippi, following Hurricane Katrina. The tree bark removal at this site extended to 8.2 m (26.9 ft), indicating an extraordinarily high storm surge at this location. Hermann Fritz, an associate professor of engineering at Georgia Tech University, led a reconnaissance effort to measure extreme water levels in three states following Hurricane Katrina in 2005 (Fritz et al. 2008). Measuring the height of tree bark removal was one field method that was most useful in many cases. See my previous post about this and other field methods. As Winston approached Fiji, waves offshore were reported as high as 39 feet (12 m), according to the New Zealand Herald and BBC News. Many places in Oceania commonly observe extraordinarily high waves, but modest storm surge heights, because the bathymetry, or offshore water depth, is relatively deep in this region of the world. 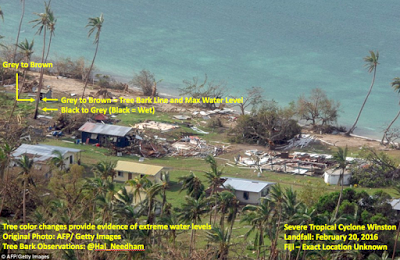 However, island regions, like Fiji, observe highly localized water levels, with bays and inlets observing strong onshore winds observing water levels much higher than other areas. It is likely that higher water marks will be observed, as Fiji is an archipelago with more than 300 islands, and today's post only examines two photos. If that maximum surge holds at around 10 feet (3 m), that would make this surge event comparable, if slightly lower, than the surge produced by Tropical Cyclone Oscar in 1983, on Beqa Island, Fiji. 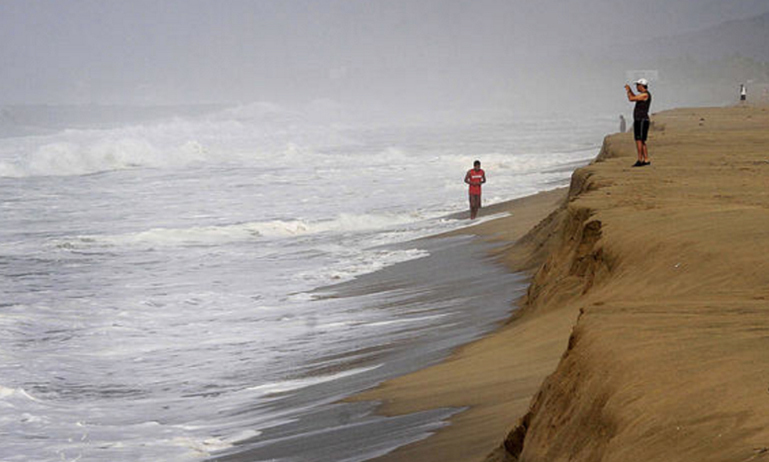 Oscar produced a storm surge as high as 9.8 - 13.1 feet (3-4 m). Oscar's storm surge is the highest credible storm surge level recorded in Fiji, according to the SURGEDAT global storm surge database. 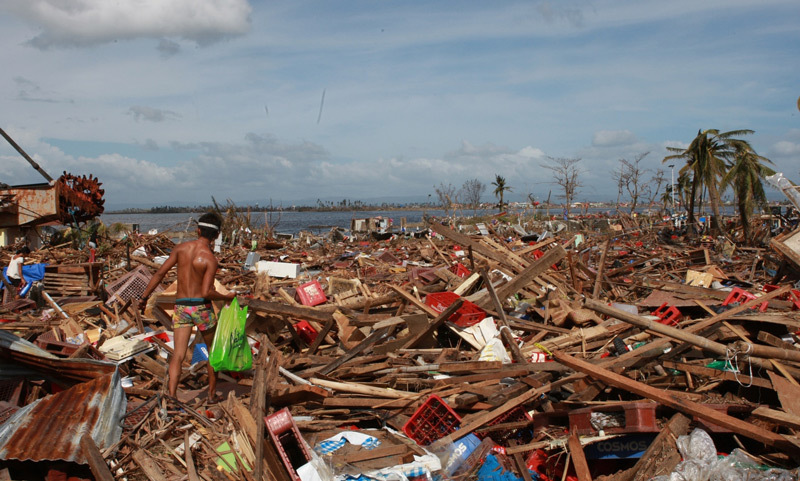 The New Zealand Herald reported a storm surge of 23 feet (7 m) from Tropical Cyclone Tomas, which struck Fiji in 2010, however, this report was not scientifically verified. 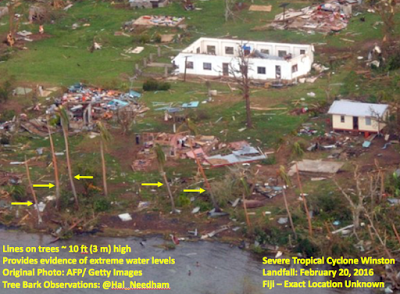 As we try to better assess the damage in Fiji, determining maximum water levels is important, because in many island regions of Oceania, saltwater overflowing islands can contaminate limited drinking water supplies and agricultural products. This is most pronounced on small, low-lying islands. Even relatively small storm surges can inflict long-term impacts if they contaminate food and water. Do you have photos that show tree bark removal, or other evidence of high water marks, such as structures that have been washed away? If so, send to email above or post on Twitter with hashtag #Winstonhighwater. Thanks, everyone. Obviously, our thoughts and prayers are with our friends in Fiji who are suffering through the aftermath of this powerful storm. Let's hope for a quick recovery.